The truth is that I lost myself long before he left me. That's probably partly why he did. Or maybe it really was all because he was lost and completely disconnected from his emotions. Maybe I was living in some fairytale delusion of my making. Who knows? I don’t, and may never, have the privilege of knowing how he ever truly felt. In some ways I guess it doesn’t matter. I have fallen far. Very far. I was in an amazing place, and then some big things brought me down. They were things I did my best to handle well, but they slowly chipped away at me. One of those situations was being on lock down with my dog for close to 6 months. I had no life, no balance, no energy. It was one of the worst times in my life, until now. He was my saving grace. He was the only light, my only true support during those times. He was everything to me, and I treated him as such. I focused so much on him and my love for him that I lost what was left of myself. In hindsight, I can see that I clung to him to avoid my own pain. So I was already lost when he left. He was just my last thread of hope. While we were together I remember thinking, in some deep unconscious place where we can't go until we've lost it all, that as long as I had him in my life I could get through anything. Well now that he’s gone I’m not getting through anything. I’m laying in molasses waiting for someone to pull me out, and deep down I know it’s him I want to be dripping sticky with me. It’s not fair for anyone to be responsible for pulling anyone out of anything. I know very well we can’t save one another. But I have always been a loyal person, someone who can’t fathom leaving without trying, someone who has always valued being there. And I believed he would always be there, on the sidelines ready to hose me down once I pulled myself out. In that time, when I was losing myself, I wasn’t really aware of what was happening to me. Everything else was consuming me. I was so low that I was just focused on getting by. What I really needed was my partner to take my hand, look me in the eye and say, “My love, you have lost your way, and I will be here for you while you find it.” I know I deserve that. We all do. But that was not what happened to me, and now I am lost and looking for myself in the darkness. I was already low, and now I am gone, and I am the only person who can get myself out of here. I feel like I’m stuck in some weird alternate reality. I am no where to be found, but I know I used to be here somewhere. My mind is smart. It tells me all of the things I need to hear. But my body feels defeated. It feels weak and heavy and oh so sad. I am weak. The last time I saw him he told me I was the strongest person he knows. But I’m not really strong. I have pretended to be strong all my life because I was afraid of being weak. But now I am weak because I have no strength to pretend. So I need it to be ok that I am weak. I need to accept that right now I am the most vulnerable I have ever been in my life, so raw and open that this kind of vulnerability has been imperceivable to me. I know, somewhere in this body and mind of mine, that through this weakness I will find true strength. I have all of the tools. I use them. Sometimes too much, and I need to pull back because I’m just too fragile right now. And that is ok. I am learning to let it be ok to be fragile, in the dark, and scared that I don’t know how to get out. I need to be ok with being at my lowest and feeling abandoned and empty and the loneliest I have ever felt in my life. And I need to do it alone. Because no one can rescue me. I know because I’ve already tried to get them to do it. It doesn’t work. This is all on me. This moment is the greatest challenge of my life, and that is why I am sharing it with you. It’s important for us to share all of the moments of life and especially the lows because they can be so scary. You may have been through your greatest challenge already or maybe you are going through it now. Maybe you’re like I was, and you can’t imagine things will ever get that bad for you again. We all know that our most difficult moments, when we really feel them and learn from them, are the moments that change our lives. This moment, right now, is the most painful experience I have ever been through, and I’ve been through my fair share of heartache. This moment is challenging me in ways I have never been challenged before. I do have small moments of clarity, glimpses into myself and who I know I am. Unfortunately for me right now, they are short lived and dampened by the lurking shadow of grief that weighs me down. It’s a feeling that starts to build up in my body. Or maybe a better way of describing it is a lack of a feeling. It’s an emptiness, a hollowness, but it’s heavy and looming. It starts as a dull shadow that slowly grows so heavy within my body that it spills out onto my face through tears I have no control over. It’s not just crying, it’s an aching within my soul. I hurt so deeply, in a way I never thought it was possible to hurt. And so I pray to get home quickly so I can cradle myself in my arms and tell myself it’s ok as I wail in bed. When my tears cease, there is no anger, there is no frustration, there is nothing but hurt. And then, sometimes, there is just nothing. From this nothingness I have to find my way out — or maybe my way back in. I have to find myself again. I don’t know exactly how to describe that to you, what that thing is that pulls me up. It’s the important part, I know. It’s the part we need to understand in order to get up and keep living. But I don’t know exactly how to tell you about it when I’m this low. I think it’s simply my will to be alive. I think it’s the part of me that still exists within me even though I can’t seem to feel it. I don’t hear my soul shouting, I think it’s too clouded with the grief of this death. The death of my partner who has transformed into someone I don’t know, the death of a beautiful love, the death of a future together. But I have had several moments of pulling myself up, whether it’s to host some new friends or to simply brush my teeth. In those moments I don’t feel myself being lifted. I don’t know how I’m doing it, but somehow I’m rising. 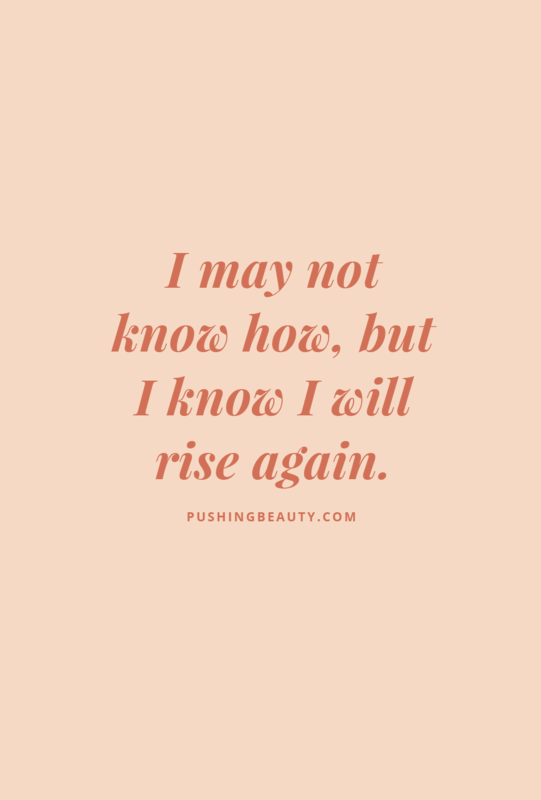 One day I know I will rise into myself again. I will be new. I will be different. I will be forever changed. But I will be me. I can’t tell you how much I long to meet myself again.